The New World (2005) is writer-director Terrence Malick’s account of the legendary encounter between explorer Captain John Smith and the American Indian (Native American) girl Pocahontas when the first permanent English settlement in America was established in 1607. Americans are well familiar with the main outline of the oft-told story, one of the key elements of American folklore – how Smith was captured by native Indians and about to be executed until Pocahontas pleaded with her chieftain father to spare Smith’s life. Pocahontas was then befriended by the colonists and later traveled to England at the invitation of the King and Queen. This seems like the material taken from a romantic fantasy, but is actually part of the historical record. Nevertheless, over the many years since that time, romanticized elaborations and exaggerations of the original story have appeared, including a recent Disney animated feature film (1995). But one would not expect such exaggerations from Malick. On the basis his previous film, The Thin Red Line” (1998), which vividly showed the harrowing experiences of the World War II campaign on Guadalcanal Island, the viewing audience likely expected on this occasion to see an intensely realistic account of these events surrounding the Smith-Pocahontas story. Indeed, Malick is famous for his painstaking attention to creating a convincing immersive atmosphere, and he seems to have spared no expense this time in his efforts to recreate the circumstances of that particular time and place. 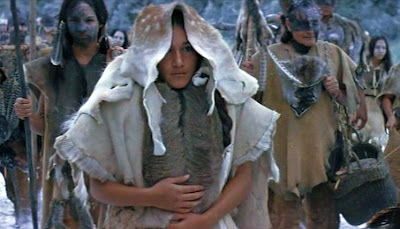 However, strict historical accuracy is not always adhered to in this film, either – there is no clear historical evidence that Smith and Pocahontas had a romantic relationship, and the timing of Smith’s departure from Jamestown has been altered by Malick in order to fit his own narrative designs. But one must always keep in mind that Malick’s focus is not so much on providing a thorough and objective historical account as it is on invoking the genuine psychological experiences of what it was like for the participants to live through those narrated events. This was certainly the case in The New World, and it is what makes the film an exceptionally rewarding viewing experience. Malick’s cinematic storytelling style is unique; his emphasis on the immediacy of consciousness and psychological experience gives the narration an entirely different tempo from that which is typically associated with an objective historical account. The major events in what would be a conventional historical account of the Smith-Pocahontas story, such as the near-execution of Smith or the subsequent “kidnapping” (taking hostage) of Pocahontas by the settlers are only briefly and cursorily covered. What is emphasized in Malick’s account, instead, is the psychological atmosphere that was invoked by such events and which dominates the feelings and perceptions of the participants in the aftermath. The “new world” referred to in the title is not so much the newly discovered North American land mass as it is the new mental landscapes that emerged in the minds of both Smith and Pocahontas as a result of their respective encounters with the exotic other. 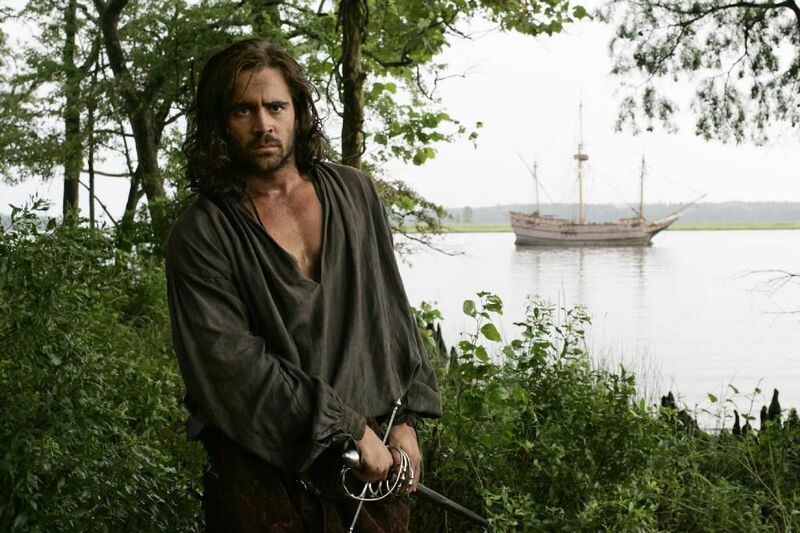 At the beginning of the film, the English ships of the Jamestown Expedition land at the Virginia coast, with one of those onboard, Captain John Smith, already a prisoner and sentenced to death for attempted mutiny. Upon arrival though, he is pardoned by the expedition’s Captain Newport and soon assigned to go upriver in search of trade with the local Indians, referred as “the naturals”. Captain Smith is captured and again about to be executed, this time by order of Chief Powhatan, when he is saved at the last minute by the pleading of the chief’s teenage daughter (with whom Smith was not acquainted up to that point). This girl we know, of course, to be the thirteen-year-old “Pocahontas”; although she is never called by this name in the film, and modern historians claim that Pocahontas was not her real name. Smith, in voiceover, expresses his utter amazement at the innocence, compassion, and spontaneous vitality of the Indians that he encounters. They seem to be graced by the “state of nature” and are unsullied by the greed and corruption common to his own experiences. While he is held by the Indians, Smith is given relative autonomy to interact with them, and although they do not share a common language, he is soon fascinated by Pocahontas, and he in turn becomes the object of her fascination. Gradually and tentatively they interact and learn to converse. This first, forty-plus minute section of the film showing their growing attachment is impressionistic and lyrical. Each of the two is completely outside the conventions and expectations of the other, so their interactions are a continual process of discovery and delighted surprise. Eventually Smith and Pocahontas are deliriously in love, but they are cautious about showing their feelings. On the condition that the English colonists return to where they came from in the spring, Smith is finally returned to the Jamestown settlement. As soon as he arrives, he is struck by the stark contrast between the perceived purity of the Indian life and the squalor of the colony. The colonists are mean-spirited, lazy, disorganized, and avaricious, constantly at odds with each other. Perhaps influenced by stories of Spanish discoveries of gold in the New World, they spend much of their time looking for gold, rather than attending to needed chores. Smith would prefer to return to Pocahontas, but he is pressed into command, since Captain Newport had returned to England for supplies. During the winter the disarray among the colonists almost causes them to perish from starvation, but Pocahontas and a small party make a surprise visit to the colony and provide them with life-saving provisions. When spring comes and the colonists do not leave as Chief Powhatan ordered, the Indians attack the colonists, who defend themselves with the devastating lethality of their firearms. Powhatan banishes Pocahontas from his local tribe for disloyalty, and the Jamestown colonists craftily arrange to acquire her as a hostage from her new Indian custodians as protection against future Powhatan attacks. Back in Jamestown, she is reunited with Smith, but life in the colony is still in turmoil. Smith is now distracted by the mundane (but compelling to him) concerns of survival and opportunity. He loses track of his love for the teenage girl, which he dismisses in his mind as a fantasy that does not relate to the hard world that he lives in. When a commission is proposed for him to lead another adventurous exploration, he leaves Jamestown and has Pocahontas informed that he drowned at sea. Pocahontas is heartbroken and inconsolable over the loss of her love. Although now living in the colony and wearing Western clothes, the depressed girl is virtually mute. Another settler, John Rolfe, takes a fancy to her and patiently tries to befriend her and help her learn Western ways. Pocahontas eventually marries Rolfe and gives birth to a son, but she and Rolfe both know that her heart still belongs to Smith. Gradually Pocahontas warms to Rolfe and is resigned to the loss of Smith. Later she visits England at the invitation of the Kind and Queen, and there she learns that Smith is still alive and that he had left her voluntarily. They finally meet privately, but their encounter this time, as awkward as those first meetings, is this time a sad expression of closure rather than of possibilities. Pocahontas embraces her new life with Rolfe, but a fuller closure arrives shortly: on the return trip to America, Pocahontas has a short illness and dies in Rolfe’s arms. Malick’s film is ultimately an excursion into the subjectivity of new love. The focalization of the first section is on both Smith and Pocahontas as they come together and discover a new world about the other and about themselves. Then as they begin to separate in the second section of the film, the focalization is shifted more to Smith’s sense of isolation and strife. This is mirrored in the armed conflict that breaks out between the two communities. In the third section, the new focalizing element of John Rolfe enters the story. He is captivated by Pocahontas, but he is a gentleman who is patiently willing to accept even a compromised life with her. Ultimately Pocahontas learns to embrace life (understood in her voiceovers as the “Earth Mother”) in its larger dimensions, which enables her to extend her loving gaze to a wider compass. The other striking theme besides love in The New World concerns the profound clash between Western culture and the state of nature, as exemplified by “the naturals”. The Western instinct to possess, dominate, and exploit is accentuated here and contrasted with the Indians’ more organic engagement with the world about them. This thematic element was reminiscent of an even more exaggerated presentation of this clash in Werner Herzog’s Aguirre, the Wrath of God (1972). The main characters in the film are well cast and delineated. Colin Farrell, as Smith, has a physical, rough-and-ready physique, but here he is very much the cautious and inward-looking perceiver, almost to a point of self-obsession. He hesitates, taking in all the strange things he encounters, before he takes action. The viewer is given the feeling of a man trying to find his way in a “new world”. But the irreversible action that he finally did take cost him dearly. He acknowledge this when Pocahontas asks him during their final meeting whether he found his “Indies” (i.e. the riches of the Indies sought by the Crown and its explorers). He responds quietly that he may have sailed right past them. This notion of a paradise found and abandoned has been told many times and reminded me of Alejo Carpentier’s novel, Los Passos Perdidos (The Lost Steps). 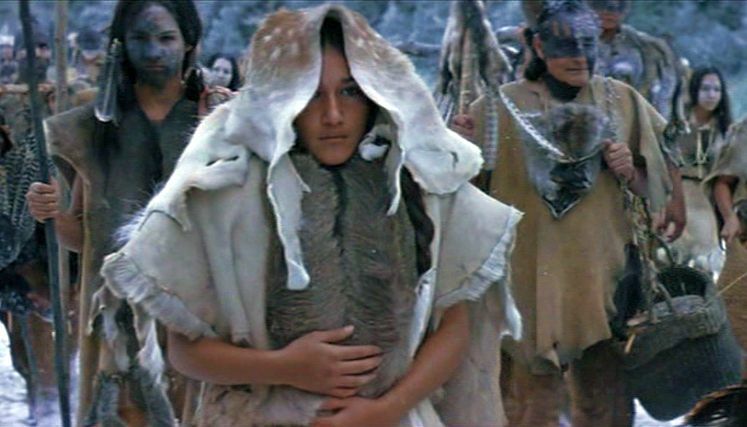 Q’Orianka Kilcher, as “Pocahontas”, was only fourteen at the time of the filming, and she gives a compelling performance as an exotic and not very shy native woman. The intimate scenes between her and Farrell are sensitively handled. Christian Bale, as Rolfe, offers a profound contrast to the inwardness of Smith. Here we see a well-meaning man whose mental landscape is settled within the scope of conventional culture. We see everything from all three points of view, and we can empathize with all of them. Despite the meticulousness of Malick’s mise-en-scene, though there were elements that I found a bit disturbing. Alterations in the timing of Smith’s departure from Jamestown are acceptable for narrative reasons, and they don’t really call into question the authenticity of the setting. But it seemed to me that Pocahontas’s skill in learning English was too rapidly acquired – especially the English as mumbled by Farrell here. In addition Farrell’s many tattoos don’t belong in this setting. Although there was tattooing in pre-Christian Europe, it was not part of 17th century European culture. Tattooing became popular among European sailors after visiting the Americas and Polynesia in the 18th and 19th centuries, but in this film Smith already had his tattoos on arrival to America. In addition Malick’s use of the prelude from Wagner’s Das Rheingold as background music on the soundtrack was probably inadvisable. Werner Herzog had used the same music in a similar fashion for his Nosferatu the Vampyr” (1979). While Herzog didn’t establish ownership to that usage, the presence of the same music here was distracting to me. But despite these small misgivings, one must give Malick his due in terms of what has been accomplished. As is his wont, Malick has offered a viewing experience that is expressed not as a linear narrative but as an impressionistic collage of little moments, all of which are left to the viewer to assemble into something meaningful in her or his mind. What is assembled is not so much an understanding but a feeling. How Malick achieves this result is somewhat mysterious, but the film includes his usual subjective tracking shots, as well as many interspersed upward shots gazing at the sky through treetops. All of these things give a feeling of one’s existential immersion in an environment that is only partially understood. One has the feeling that there is always more than what you see right in front of you – something behind you or just out of sight that is unknown and mysterious. To Pocahontas this the voice of the Earth Mother. To others it is the mystery of love.